Coach Pete as Cal’s next coach? Please make it happen SB! It’s been less than 2 weeks since Jeff Tedford was relieved of his duties as the head coach of the California Golden Bears. Since then, rumors of contact with potential candidates have run rampant, while Sandy Barbour and the Cal athletic department have offered minimal comment on the ongoing search. What we do know so far is that Cal has retained DHR International – the same executive search firm that Stanford used to uncover the then obscure Jim Harbaugh from the depths of Division II. Sandy Barbour recently confirmed in an interview (courtesy Bearinsider) that the search process will “be moving as fast as we possibly can without sacrificing the right person filling the position.” She also noted that while there was interest in the Cal job during the season, she would wait until prospective candidates’ seasons are over before conducting formal interviews. But now that the final games of the college football regular season are over, the Cal coaching search should soon kick into high gear. – Great fit for Cal (more below). Proven winner & 2 BCS appearances, including a Fiesta Bowl win over Oklahoma. Exceptional developer of talent (multiple NFL draft picks despite recruiting disadvantages). NorCal (Yuba City) native & UC Davis alum. – Young (39) and highly regarded in coaching circles. Innovative offensive mind & creative game planner, despite not calling plays for Oregon’s high-octane offense. Track record of developing college QBs (Bart Hendricks, Andrew Walter, Jeremiah Masoli, Marcus Mariota). Reportedly the heir apparent to Chip Kelly at Nike U. – Young (39) and charismatic. Excellent motivator & recruiter (outrecruited USC for Manti Teo). Bright defensive mind (turned ND’s defense from a mediocre unit 3 years ago to arguably the top defense in CFB this year). 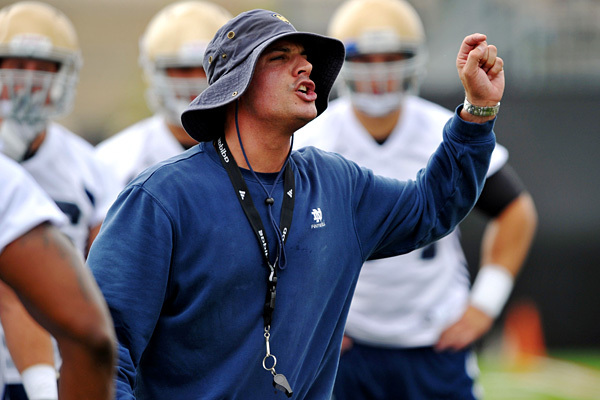 Brian Kelly’s right-hand man at ND. – Named AFCA assistant of the year while DC at Duke. Rebuilt SJSU program from the ground up, both on the field and in the classroom (raised APR to bring SJSU off of NCAA probation). Solid recruiter (top rated class in the WAC last recruiting cycle). – *No longer available as of 12/1. Accepted offer & officially hired as NC State head coach, a day after leading NIU to the MAC championship. – West Coast ties (former UW OC). Coached productive offenses at UW, developed QB Keith Price. Possible sleeper candidate. Other rumored candidates include NFL coaches Hue Jackson (Bengals assistant/former Raiders HC) & Ron Rivera (Panthers HC & Cal alum), and current college head coaches Sonny Dykes (Louisiana Tech) & Gary Andersen (Utah State). By most accounts, Petersen is the obvious #1 target – Cal fans’ “dream candidate” if you will – but more on Coach Pete in a moment. Jackson has expressed strong interest and will reportedly be interviewing, per tweets by Yahoo columnist & Cal alum Mike Silver. Dykes has also reportedly interviewed, and a report by the CC Times’ Jeff Faraudo does nothing to quash that rumor. As of December 1, none of these rumors have been confirmed by the Cal AD, while Andersen stated that he will remain at Utah State after signing a contract extension. In our opinion, neither Jackson nor Dykes should be considered serious candidates for the Cal job. Jackson, despite his West Coast history, including past stints many years ago at Cal & USC, doesn’t seem like a good fit for Cal. He’s been a journeyman coach (no coaching stop for longer than 3 years), and was a polarizing figure at his last high profile job as HC of the Raiders. As for Dykes, while his explosive Air Raid offenses (at LA Tech, Arizona, Texas Tech) and Pac-12 background are a plus, his team’s lack of success on the defensive side of the ball is a concern. LA Tech is among the nation’s leaders in both scoring and total offense, but trends towards the bottom in several defensive categories. Chris Petersen would fit Cal right down to a tee. He’s one of the most well-prepared gameday coaches in the business, and can make creative in-game decisions that occasionally swing games in favor of his team. … He has great recruiting roots in the region. He’s a Northern California guy and graduated from the UC system and is fairly dedicated to academics. And he’s still relatively young (48 years old, and entering his college football prime). For Cal, offering a market-rate compensation package (for both CP and his potential staff), plus highlighting the consequences of the changes mentioned above (particularly BSU’s move to the geographically-challenged Big East), are a given at the negotiating table. But for Coach Pete, family is likely the most important consideration: his father still lives in Yuba City, and his wife’s family also lives in Northern California. The health of his son (diagnosed with a brain tumor several years ago, but now healthy) is a factor as well. Moreover, Cal would potentially be competing against Oregon for his services – CBS Sports’ Bruce Feldman was quick to report that Cal & Oregon were the two jobs that CP would consider leaving Boise for. And lastly, Petersen could easily decide to stay at Boise, making this whole discussion moot. But until he says no, we can hope for the best. 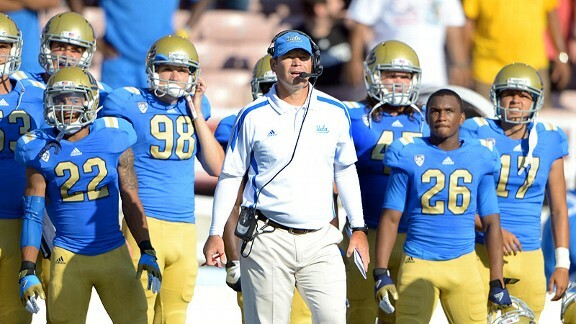 Whomever Cal hires – whether Petersen, or another candidate – will be inheriting a fairly talented Cal team in 2013. Cal has talent on both sides of the ball – Kline, Bigelow, Harper, Treggs, Powe, Rodgers, Tagaloa on offense; Sebastian, McClure, McCain, Scarlett, Forbes, Coleman, Barr on defense – the cupboard is certainly not bare. While there are question marks, especially at OL and depth on the DL, the new Cal coach could conceivably lead a first-year turnaround similar to Mora’s results at UCLA this year. The key will be to find a coach that can maximize our players’ potential both on the field and in the classroom. In any case, the upcoming week should prove to be interesting, as most Cal insiders predict the new coach to be selected and announced within the next 10 days. Stay tuned and Go Bears!